Overview MapBenthic Ecosystems and Environments: Benthic ecosystems of the Florida Keys and reef tract vary due to location, onshore and offshore geomorphology, and different exposures to the generally southeasterly winds and waves. Onshore ecosystems are largely defined by geology (elevation, and fresh- or saltwater settings) and urban development (vegetated or non-vegetated) (see Gallagher et al., 1997). Offshore ecosystems vary in size, shape, distribution, location, and number depending on how they are classified (Table 2). Each has its distinct ecologic characteristics and biologic community. A thorough sourcebook for ecologic environments, types of vegetation and wildlife of the keys, whether marine or terrestrial, native or migratory, is found in Gallagher et al. (1997). The book also contains reports on the quality and preservation of the keys' natural resources and interesting notes on cultural heritage. Benthic Ecosystems map and pie chart: The benthic map shows 22 types of habitats identified from the northern Florida Keys to The Quicksands (from Lidz et al., 2005). The habitats were derived from field observation, prior knowledge, and interpreted aerial photomosaics. Three are terrestrial, including a roads/airports map unit. In terms of spatial area mapped, the largest marine habitats are the zones of sea grasses on lime mud (27.5%; Hawk Channel), sea grasses on carbonate sand (18.7%; outer shelf and The Quicksands), and bare carbonate sand (17.3%; outer shelf and The Quicksands). Together, they constitute 63.5% of the total acreage mapped (314,060.21 hectares = 776,032.17 acres = 3,140.5 km2). The fourth largest habitat is the zone of bare lime mud or seagrass-covered muddy carbonate sand (9.6%; inner shelf). All other habitats together equal 26.9% of the mapped area. Precision of map-label placement on coral reefs was verified by overlaying the benthic dataset on top of geo-referenced NOAA raster nautical charts. The pie chart shows areas and percentages of total area mapped for habitats and urban features (roads/airports). The acreage of each map unit was derived from the original benthic-habitat ArcInfo coverage. The coverage was converted into an ArcView shapefile and re-projected from geographic (latitude/longitude) into UTM coordinates. The re-projection converted the acreage from a measurement of degrees into area (m2 and km2). The following subheadings match the color-coded map units on the Benthic Ecosystems overview map and accompanying pie chart. The map units are listed roughly in a seaward direction. The first two units and the last in the pie-chart key are terrestrial units. All others are marine units. Area (in km2) given in descriptions for each subheading in this section indicates the spatial area of that map unit within the total area mapped (3,140.5 km2). The km2 values are converted to percentages for each map unit within the total area mapped. Examples of the benthic features/ecosystems mapped are visible in the aerial photomosaics from which the interpreted map was primarily derived (e.g., Fig. 11). Fine-scale features not visible at the scale of this overview map can be seen in the detailed close-up individual tile maps (see, for example, Benthic Ecosystems for Tile 1). The subheadings and color-coded map units also apply to the close-up maps. Roads/airports cover 8.43 km2, or 0.3% of the area of the Florida Keys that was mapped (see pie chart). Subaerially exposed Pleistocene limestone and/or spoil fill (75.90 km2, 2.4%): Subaerially exposed limestone areas on the keys are either Key Largo/Miami Limestone in depositional position or spoil islands created from cut-and-dredged limestone. These areas have usually been modified by urban development and are now cut by canals and covered by roads and buildings. A thin band of limestone with little vegetation is present between the freshwater environment of the hardwood forest and saltwater habitat of the mangroves. Hardwood forest (38.93 km2, 1.2%): Hardwood forests consist of tropical hardwoods that grow in a thin soil on elevated areas of the exposed Key Largo/Miami Limestone. Spoil islands do not support hardwood forests. Endangered tree snails live on the tree limbs, and various small rodents occupy the forest. Several species of snakes, including the diamondback rattlesnake, inhabit this ecosystem. Terrestrial wildlife is limited mainly to vegetated areas. Mangrove forest and peat (70.95 km2, 2.3%): The mangrove zone fringes the shoreline and displays a characteristic zonation of the three major mangrove varieties. The red mangrove (Rhizophora mangle) with its characteristic prop roots is the most dominant type and is found on the seaward edge of the forest. The black mangrove (Avicennia germinans) with its vertical pneumatophores occupies the middle zone. The white mangrove (Laguncularia racemosa) is located on the landward parts of the stand. Large areas of mangrove forests overlie thick (>1 m) accumulations of mangrove peat. Many attached organisms such as filamentous algae (Bostrychia and Ceramium spp. ), hydroid colonies, and tunicates are found on the stems and roots of the mangroves. On the more prominent aerial parts of the plants are found several gastropods (Tectarius muricatus, Littorina angulifera, and Melampus coffeus), tree oysters (Isognomon alatus) and crabs (Goniopsis cruentata). A large assortment of animals lives in the shallow water at the base of the mangroves, including flatworms, annelids, jellyfish (Cassiopea xamachana), fiddler crabs (Uca spp. ), horseshoe crabs (Limulus polyphemus), and small forage fish. The mangroves and mangrove-peat accumulations are cut by hundreds of natural tidal channels and man-made canals. Mangroves are protected trees throughout the State of Florida. Tidal creek (61.65 km2, 2.0%): Tidal creeks through the mangrove forest sustain wetland nurseries and a large variety of organisms, including threatened and endangered species. The mangrove roots are habitat for attached organisms, worms, jellyfish, crabs, and small forage fish. Sea grasses (Thalassia spp.) populate much of the creek-channel floors. The sediments are mostly Halimeda sand and occasional cobble-size pieces of limestone that have eroded from channel walls, or corals and molluscs that have washed in during storms. If storms are sufficiently severe, currents can scour the channels to bedrock. Carbonate sand on Pleistocene coral reef limestone (46.15 km2, 1.5%): Sand-covered bedrock is usually found adjacent to the mangrove fringe along a nearshore rock ledge that borders the seaward side of the keys (Fig. 13). The inner part of the ledge is covered with thin (<30 cm) sands, while the outer part is usually bare rock. Sandy areas are sparsely populated by the seagrass Thalassia testudinum and often contain the same algae as are found in the bare limestone zone. Both inner and outer ledge zones host an inshore hardbottom habitat, which is also found along intertidal parts of the keys and in channels between the keys. The rock ledge is shallow (0 to 4 m) and harbors different biota depending on sediment thickness and current velocity. Generally, scattered sea grasses, Sargassum seaweed, gorgonians, and several species of sponges, most notably large loggerhead sponges, populate the inshore hardbottom habitat. Sea grasses are abundant in 30- to 50-cm-deep, circular, sediment-filled holes that pockmark the limestone surface. Because sunlight generally penetrates to the ledge surface, marine life is abundant and diverse, though less luxuriant than that in the offshore hardbottom habitat (compare on Table 2). The inshore community reflects highly variable conditions. Seawater temperature and salinity are affected by rainfall, atmospheric temperature, and submarine groundwater seepage. Minor changes in tidal amplitude, wind intensity, and wind direction may result in noticeable changes in turbidity. Nearshore, there is little water movement and turbidity is generally low except during storms. The inshore community is more diverse off the upper and lower Keys than off the middle Keys, reflecting the influence of turbid, nutrient-rich Florida Bay water on middle Keys organisms (Enos, 1977; Marszalek, 1977). Winter storms bring cold, sediment-laden bay waters to the ecosystem (Roberts et al., 1982), and hurricanes produce warm, turbid waters. Only the hardiest organisms are able to survive in the inshore hardbottom habitat, which has both restricted-circulation and high-velocity communities. Unlike deeper-water corals, non-reef-building corals have developed a mucus system that can withstand the high suspended-sediment levels sometimes found in the shallow water (Yonge, 1940; Thompson and Bright, 1977; Rogers, 1990). Various species of sponges dominate high-velocity communities located in tidal channels and in seaward regions between islands and patch reefs. Strong currents generally sweep across channel communities. Bare Pleistocene coral reef limestone (89.42 km2, 2.8%): Inshore hardbottom habitat is also found on the outer edge of the nearshore rock ledge (Fig. 13). Head corals populate this area of the ledge in the lower Keys. Seagrass-covered sand on rock ledge (4.98 km2, 0.2%): Though the seaward part of the ledge is essentially free of sediment, the landward part is sandy in places and is covered by sand and sea grass in others. Coralline red algae (0.48 km2, ~0.0%): Abutting inshore hardbottom habitat in localized areas is the shoal-fringe habitat or coralline red-algae zone, in which a zonation of distinctive organisms colonizes the windward edge of shoal banks near the keys. The best known such banks are at Tavernier and Rodriguez Keys off Key Largo (Fig. 13; Turmel and Swanson, 1976; see Benthic Ecosystems for Tile 1 and Tile 2 maps). Where best developed, the zones consist of shallow (<~1 m ) areas of coralline red algae, namely species of Goniolithon, and a deeper (to ~2 m ) finger-coral area. Thickets of the shoal-fringe community act as protective borders by dissipating energy that might otherwise erode muddy sediments of the shoal banks. Corals are excluded from the coralline red-algae zone because of subaerial exposure during spring low tides. The 0.0% area given is approximate. The coralline red-algae zone does exist, but it is a very small habitat. Sea grasses on lime mud (864.70 km2, 27.5%): The most extensive seabed habitat consists of sea grasses on lime mud and occupies nearly all of Hawk Channel and its westward extension south of the Marquesas-Quicksands ridge. The dominant sea grass is Thalassia testudinum, but sea grasses are sparse or absent in deeper parts where depth and turbidity attenuate sunlight. Bioturbated lime mud containing skeletal grains of Halimeda species and whole shells and fragments of various molluscs forms the substrate. (Sediments are said to be bioturbated or disturbed when burrowing organisms have mixed them.) This ecosystem begins at the base of an abrupt 30-cm-high scarp at the seaward edge of the nearshore rock ledge (bare limestone zone, light blue map unit) where sediments pinch out at the landward edge of the Hawk Channel bedrock depression. Sediments thicken seaward to an average of ~4 m within the channel (see Sediment Thickness map). Large loggerhead sponges are scattered throughout the zone with abundant sediment mounds created by burrowing crustaceans and sea cucumbers. Sea-biscuit urchins live on the sediment surface, unable to plow through the mud because of seagrass rhizomes. Bare lime mud or seagrass-covered muddy carbonate sand (302.87 km2, 9.6%): Commonly associated with wackestone (a very fine-grained limestone) in the rock record, this zone is found in Hawk Channel, often associated with patch reefs (Fig. 11). Most bare lime mud occurs off the upper Keys where current flow and winnowing are dampened by a lack of tidal passes. The sediment is mixed lime mud and carbonate sand similar to that in the surrounding seagrass-covered lime-mud areas but is less bioturbated by burrowing organisms. Bare lime-mud faunas are greatly reduced. Few organisms live in seagrass-free areas, which are severely scoured during storms. Sea grasses either were removed or never grew in this zone. Sea grasses re-colonize such spots very slowly due to lack of light attributed to turbidity and deeper water depths. Sea grasses on carbonate sand (587.63 km2, 18.7%): The second largest seabed habitat consists of the seagrass/sand community, located on the outer shelf. Mixed sea grasses, usually Thalassia testudinum and the cylindrical manatee sea grass, Syringodium filiforme, inhabit this zone. The sand is composed mainly of fragments of Halimeda opuntia and H. trident. The sea-biscuit urchin Clypeaster rosaceus lives throughout this zone. Species of conch (the Queen conch Strombus gigas, Queen helmet conch Cassis madagascariensis, and King conch C. tuberosa) are found mainly in the seaward part, especially near the coral-rubble and coral-rubble/carbonate-sand zones. Storms can create seagrass-free blowouts, exposing underlying sand. Sea grasses on sand provide shelter, nurseries, and food. Grasses also stabilize sandy and muddy bottoms and enhance water quality by reducing turbidity through entrapment and removal of suspended grains from the water column. Bare carbonate sand (542.80 km2, 17.3%): Composing the third largest habitat, bare carbonate sands are typically ~1 to 5 m thick (Lidz et al., 1997a). A prime example is White Bank off the upper Keys (Fig. 14), an area of thick (4 to 6 m) sands extending ~40 km along the outer shelf off north Key Largo (Enos, 1977). Unnamed areas of bare sand occur elsewhere along the outer shelf. The sand consists predominantly of algal plates of several species of Halimeda along with grains of corals, molluscs, bryozoa, echinoid spines, and shells of microorganisms. In shallow areas, sand grains are rounded and polished but are not oolitically coated (concentrically coated with carbonate). In places, the sand is partially cemented to form friable rocks, especially around holes of burrowing organisms. Sand dollars (Clypeaster subdepressus) and red-heart sea urchins (Meoma ventricosa) plow just beneath the surface. Areas dominated by clean calcareous sands may seem barren but they are not devoid of marine life. The sands contain a specialized fauna composed of polychaete worms and small burrowing organisms (Table 2). During periods of calm seas, the upper surface is partially stabilized by diatom mats and blue-green algal mats constructed by species of Penicillus and Batophora. Storms remove sea grasses that may start growing, resulting in blowouts that help maintain this zone. Coral rubble and carbonate sand (4.48 km2, 0.1%): Covered by sea grasses, this zone is usually transitional with the coral-rubble zone located behind skeletal Holocene reefs on the fossil shelf-margin reef. Sargassum seaweed and sea grasses generally grow attached to scattered coral rubble. Coral rubble (7.49 km2, 0.2%): Concentrated by storms, coral rubble often forms elongate fields behind major Holocene reefs, such as at French Reef (Fig. 14), and is usually found on the landward side of the fossil shelf-margin reef. Queen conchs favor sites of coral rubble. Alcyonarians and gorgonians are not common due to frequent reworking of rubble substrate during storms. Senile coral reef (70.19 km2, 2.2%): Senile coral reefs, or reefs that are no longer actively accreting solid reef framework, make up the offshore hardbottom habitat (Table 2). Senile reefs consist largely of linear shelf-margin hardbottoms populated by alcyonarians and hydrocorals with scattered head corals, mainly Montastrea annularis, Colpophyllia natans, Diploria strigosa, and a few branching colonies of Acropora cervicornis and stunted A. palmata. Holocene A. palmata have constructed well-developed spurs and grooves on these reefs (Fig. 15; Shinn, 1963). The spurs are no longer growing and are often encrusted with a thin coating of the stinging hydrocoral Millepora spp. (Fig. 16A, 16B, 16C, and 16D). The discontinuous outer-shelf coral-rock ridges are primarily found in this senile coral reef zone. Abundant alcyonarians and gorgonians occupy stabilized, dead coral surfaces. Gorgonians are often oriented perpendicular to local current flow to feed efficiently and thus provide information about typical current patterns in the area (Booker, 1997). Large barrel and loggerhead sponges are also common. Areas of thin (2-10 cm) sediment contain mixed algae that attach with holdfasts. Areas of thicker cover (up to 30 cm) contain sea grasses attached with rhizomes. Live coral reef (22.73 km2, 0.7%): Live corals in the vicinity of the Florida Keys are generally restricted today to scattered patch reefs found shoreward of the outer-shelf reefs. Off the upper Keys, patch reefs line coral-rock ridges (Fig. 14). Off the lower Keys, patch reefs of individual corals occupy the outer edge of the nearshore rock ledge (Marszalek, 1977) and form clusters of corals behind the outer-shelf reefs (Fig. 11). Thousands of patch reefs are found in the middle of Hawk Channel (Figs. 11, 14). Most are found ~3 to 7 km from the keys, between Hawk Channel and the linear outer-shelf reefs. Patch-reef distribution is uneven along the shelf with most reefs clustered in relatively few areas. More than 4,000 patch reefs occur seaward of Hawk Channel in the upper Keys (Jaap, 1997). Although rare in the middle Keys, patch reefs are found close to the keys in areas where they are protected from the influence of Florida Bay waters. In the lower Keys, offshore clusters again number in the thousands (Marszalek, 1977). Patch reefs usually consist of large head corals (Montastrea annularis, Diploria strigosa, Colpophyllia natans, Siderastrea siderea). Clusters of various species can cover areas as large as 100 m to several kilometers in diameter. Alcyonarians and gorgonians can be abundant on patch reefs. Patch reefs are often spherical but can also demonstrate lateral expansion, growing parallel to the shelf margin. Sand halo around patch reef (39.08 km2, 1.2%): Sand haloes generally surround patch reefs (Figs. 11, 14). A combination of wave action around resistant reef structures and foraging by organisms closely associated with the corals excavates sea grasses to create these conspicuous haloes. Man-made treasure-salvor sand holes (0.01 km2, ~0.0%): Treasure salvors search for buried shipwreck artifacts using mechanical devices called mailboxes. Mailboxes consist of an 0.6- to 1.2-m-diameter (2- to 4-ft) metal elbow that deflects a boat's prop wash downward to displace large amounts of sand. The holes created are usually about 10 m in diameter and 6 m deep. Digitizing enlargements of the scanned 1975 aerial photos revealed one such area where 11 teardrop-shaped and circular sand holes were visible in a transect across a seagrass-covered sand area on the outer shelf east of East Turtle Shoal (see Benthic Ecosystems for Tile 4). It is not known when those footprints were made. The largest sand hole is estimated from on-screen measurement of the enlarged aerial to be about 60 by 120 m in size. The salvors' transect covers a distance of approximately 1.5 km. The 0.0% area given is approximate. The treasure-salvor sand holes do exist, but areal extent of those mapped is very small. Bare Pleistocene oolitic limestone (250.35 km2, 8.0%): The Miami Limestone oolite extends westward from major exposures as islands of the lower Florida Keys to form submerged bedrock on the Marquesas-Quicksands ridge located west of Key West in the Gulf of Mexico (Shinn et al., 1990). Sponges, gorgonians, and Sargassum seaweed populate areas where the bedrock is free of sediment. Karst-like depressions 30 to 50 cm deep pockmark the surface, generally nearshore in the lower Keys. These depressions contain sand and dense sea grasses. A mixed seagrass and bare oolite zone is transitional between areas of bare oolite and carbonate sand on oolite. Sea grasses are primarily Thalassia testudinum. Carbonate sand on Pleistocene oolitic limestone (17.57 km2, 0.6%): Sands on the oolitic bedrock of the Marquesas-Quicksands ridge are generally coarse-grained and consist almost exclusively of fragmented plates of Halimeda (Hudson, 1985). Sands that form tidal deltas associated with submerged channels are generally muddy and shallow. Lime muds have collected in the central bedrock depression of the Marquesas Keys. Strong reversing tidal currents shape the ridge sands into north-trending tidal bars superimposed with west-trending sand waves (Fig. 17; Shinn et al., 1990). The Bedrock Topography map shows the ridge is ~10 m higher than surrounding bedrock. Thus, the sands are formed on the ridge. Always in motion due to the strong currents, the sands are eventually swept westward off the ridge. Although skeletal Holocene corals overlie isolated topographic highs of linear bedrock corals at the edges of the ridge, few corals are alive there today (Shinn et al., 1990). Wintertime Gulf of Mexico temperatures retard coral growth. Outlier reef (33.70 km2, 1.1%): High-relief (up to 30 m) outlier reefs are located on the upper-slope terrace seaward of the shelf margin and are separated from the margin by empty or partially filled backreef troughs (Fig. 18; Lidz et al., 1991). The outlier reefs are discontinuous and extend for more than 200 km along the margin. They are best developed off the lower Keys where four tracts have been identified (Lidz et al., 2003). These reefs are Pleistocene (Ludwig et al., 1996; Toscano, 1996; Toscano and Lundberg, 1999), with a thin (~3.4 m) cap of skeletal Holocene corals (Toscano and Lundberg, 1998). Loggerhead and vase sponges are the dominant organisms on the outlier reefs. Scattered head corals of all kinds are present along with scattered staghorn corals. Gorgonians are also present. These organisms are typical of offshore hardbottom communities. Where outlier reefs are absent, the upper-slope terrace zone is generally covered with ~3 to 4 m of bare carbonate sand, the same sediment thickness as is found on most of the shelf (Lidz et al., 2003). Algal nodules characterize the sands (Table 2). Where outlier reefs are present, the sands likely also contain coral rubble swept landward from the reefs into their backreef troughs (Fig. 18). Light attenuation due to water depth and common turbidity preclude growth of sea grasses in this zone. Map Differences: Other maps of distribution and types of habitat on the south Florida shelf have been made (Enos, 1977; Marszalek, 1977; Multer, 1993; Lidz et al., 1997a; FMRI, 2000). However, the earlier maps are generalized, or are geographically limited in area (Lidz et al., 1997a), and are considerably less detailed than the dataset presented in this report. The pre-1997 maps also lacked the high-precision dating and GIS technology available today. A comparison of the habitat map in this report and the most recent shelf-wide atlas dataset (FMRI, 2000) shows substantial differences. The primary differences are resolution, and therefore habitat distinction, and geologic history. The dataset in this report has 22 descriptive map units. The atlas has 10 generalized map units. Datasets in this report are accompanied by extensive geologic background, whereas the atlas lacks explanatory text of any nature. On the other hand, the geographical area covered by the atlas extends beyond the area of the map in this report. To the northwest, the atlas includes the shelf off north Key Largo. To the west, it includes an area beyond The Quicksands, a gap in coverage, and then the area around the Dry Tortugas. A comparison of terminology between the benthic dataset in this report and the FMRI atlas underscores the difference in resolution and habitat distinction. Onshore habitats described in this report include subaerially exposed Pleistocene limestone and/or spoil fill, hardwood forest, and roads/airports. The atlas differentiates land and inland water. Nearshore habitats in this report are mangrove forest and peat, tidal creek, carbonate sand on Pleistocene coral reef limestone, bare Pleistocene coral reef limestone, seagrass-covered sand on rock ledge, coralline red algae, bare Pleistocene oolitic limestone, carbonate sand on Pleistocene oolitic limestone, and bare lime mud or seagrass-covered muddy carbonate sand. The atlas shows 'unknown bottom' in canals and tidal channels, hardbottom, and patchy seagrass in the nearshore area. In Hawk Channel, the map in this report shows habitats of sea grasses on lime mud, bare lime mud or seagrass-covered muddy carbonate sand, live coral reefs, and sand halos around patch reefs in Hawk Channel. The atlas differentiates areas of patchy seagrass, continuous seagrass, and patch reefs in the channel. 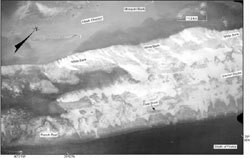 On the outer shelf, the map in this report depicts sea grasses on carbonate sand, bare carbonate sand, man-made treasure-salvor sand holes, coral rubble and carbonate sand, coral rubble, live coral reefs, and senile coral reefs, with outlier reefs on an upper-slope terrace in front of the senile (shelf-edge) reefs. The atlas shows patchy seagrass, bare substrate, patch reefs, 'unclassified,' and hardbottom behind platform-margin reefs fronted by deep water. Although 'man-made treasure-salvor sand holes' cannot scientifically be considered or classified as a 'habitat,' the sand holes mapped in sand and seagrass beds east of East Turtle Shoal are distinct and thus were assigned a map unit. They are, in essence, bare sand. For scientific purposes, their area (0.01 km2) can be lumped with that (542.80 km2) for the bare carbonate-sand map unit.